Last months saw the launch of Wednesdays at the Warehouse at Warehouse421 in Abu Dhabi, a curated program of creative activities and events taking place every other Wednesday. Here's the schedule of events for this month. Rooted in the vision to support emerging artists in the UAE, this panel discussion explores the theories, practices, and pedagogy around the importance of creating an environment that nurtures and develops artists in the UAE, while honoring an artist’s natural tendency to seek out community. 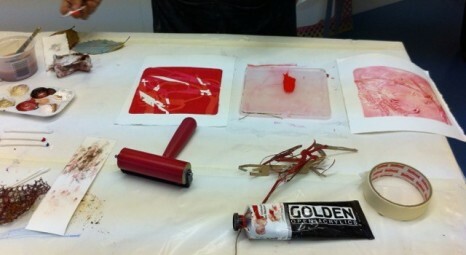 Using photocopies of photographs (printed on a laser printer), this workshop will introduce participants to acrylic transfer techniques. Using fluid acrylic mediums they will experiment with direct “wet” and “dry” image transfer techniques. Participants are encourages to bring several black and white photocopies of their photographs, that have been printed on a laser printer and not on an inkjet printer. The transfer technique will not work on photocopies made on an inkjet printer. Domestic scenes filmed in Cairo and New York unfold to a continuous stream of talk shows and onscreen text, at times transcribing the exchanges and at others bringing the viewer into the director’s interior world. The 24-hour news cycle and social media networks supersede national borders, revealing both an existential fatigue in light of world affairs and guarded playfulness at having—through the cinematic process—carved out time shielded from them. Those who have fully enjoyed their bodies cannot be submissive. And those who never have? Can they survive the slavery of solitude and impotent acceptance of what they can't change or embrace? This is the everyday story of two women taking care of their sick man.